I am pleased to announce that Spectrum Equity recently led a significant investment in Verisys, a leading provider of technology solutions and primary-source data on healthcare professionals and businesses. Verisys is a great fit for Spectrum given our experience in risk & compliance (World-Check, BMI, Verafin) and healthcare data & IT (Passport Health, Definitive Healthcare, Net Health). You can read more about the investment in the official press release, but I wanted to share a little more about why we are so excited to be partnering with CEO John Benson and this phenomenal company. Verisys is helping address big structural problems in the US healthcare system. Roughly 10% of US healthcare spend, or $320 billion, is estimated to be lost to fraudulent claims. Even more telling, the federal government recently released a study showing that over the past three years, for every $1 that HHS or DOJ spent on healthcare fraud and criminal cases, they have returned $6 in judgments and settlements to taxpayers and the Medicare Trust. No matter how you look at it, fraud and other abusive activities are endemic to US healthcare, and there’s a big opportunity for innovative companies like Verisys to make the system more efficient and secure for both healthcare organizations and consumers receiving care. If you are interested in getting a better feel for the types of fraud and abuse schemes happening every day that Verisys aims to address, I’ve collected a few of my favorite ‘horror show’ examples from press articles over the past year. You can click through to the underlying article as well. Behind every healthcare crime or fraud scheme is an individual or business entity who may already have been censured, sanctioned, disbarred or been found guilty of criminal or civil cases previously. It is therefore no surprise that one of the most effective ways to identify and stop fraud and abuse is to perform ongoing due diligence on these healthcare providers. Healthcare organizations are beginning to wake up to this strategy, and many are adopting screening, credentialing and monitoring programs to keep bad actors out of the system, or at the very least know their higher risk care givers so that they can monitor their activities more closely. In doing so, these organizations can materially reduce the risk of being on the wrong side of fines and penalties, civil lawsuits, reputational damage and in extreme cases, criminal prosecutions. 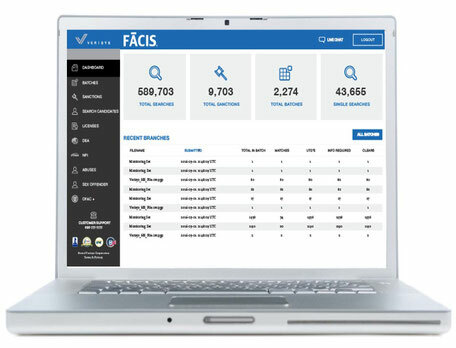 Verisys is best known today for developing the Fraud and Abuse Control Information System (“FACIS”), a highly structured database of up-to-date risk-relevant information on healthcare providers that is used to power automated compliance and risk management programs for many of the largest pharmacies, hospitals and background screening platforms. 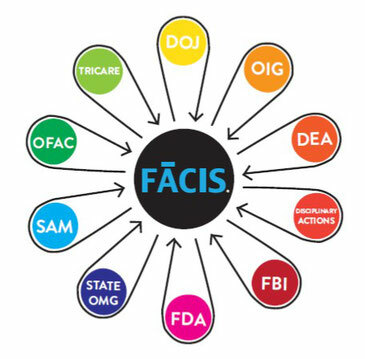 FACIS enables ‘gatekeeper’ due diligence screening and monitoring, where healthcare organizations are able to move away from ad-hoc, manual processes and to use the Verisys platform to develop and maintain a comprehensive view of their providers, and to get real-time alerts for any changes in licensing status or sanctions that might put their organizations at risk. More recently, Verisys has launched innovative SaaS solutions that move the FACIS database deeper into key healthcare workflows, including provider credentializing and real-time transaction screening platforms. We’re very excited to work with the Verisys team to accelerate investment in these initiatives. Our enthusiasm starts with the CEO and co-founder that we’ll be backing here, John Benson, who has built a highly differentiated platform and data asset leveraging his deep subject matter expertise in this complex, highly regulated area of healthcare. Our experience from over a decade investing in risk & compliance technology businesses has been that the combination of a pioneering CEO, a unique database asset, a strong track record of product innovation and deep subject matter expertise all contribute to building a market leading company. Verisys checks all of these boxes for us. We are optimistic that our partnership, which will initially focus on accelerating investment in the platform and working closely with John to build out a targeted enterprise sales & marketing organization, will yield a very interesting growth opportunity for the company … with the potential to drive meaningful improvements to the US healthcare system over the course of our investment!